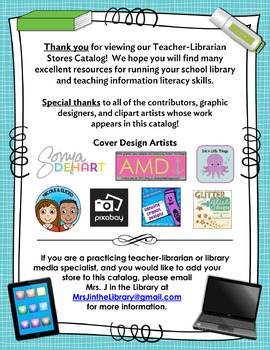 The 2018 TpT Librarian Stores Catalog has back-to-school tips for new and veteran teacher-librarians and media specialists to help them stay organized and make the most of their time. It showcases TpT stores that sell materials specifically designed for school library or media center instruction and management. Check out new and innovative products from your favorite sellers, and discover a new store with your next favorite resource! Feel free to share this catalog with colleagues, embed it on blogs, post the link on Twitter or Facebook, or even print it out if necessary. P.S. 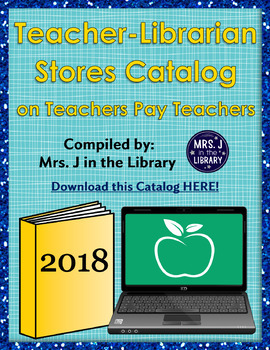 - If you are a practicing teacher-librarian or library media specialist with a TpT store, you may submit 1 or 2 pages to the catalog at any time. Please e-mail Mrs. J in the Library (contact info in the catalog) for more information and submission guidelines. If you like what you see here, please consider leaving feedback below, or follow me on TpT to get email updates about my store, new products, and sales!